President Trump is due to visit Pittsburgh today to honour the 11 Jews of the Tree of Life Synagogue who were gunned down in the deadliest antisemitic attack in US history. Certainly, some don’t want him there: the Mayor of Pittsburgh has suggested the President wait a week, not least because today is the first of the funerals which are scheduled to continue up to Shabbat, and the President’s presence will undoubtedly be a colossal distraction when the focus of mourning and blessing should be on the dead and their bereaved families. But others will be musing that heads of state invariably clear their diaries to visit the scene of a national tragedy, and they do so in a timely fashion to express their condolences. It’s a hard balancing act: to attend promptly may offend; to delay risks allegations of indifference and disrespect. No doubt the White House mulled the strong feelings on both sides. But you got none of that understanding from Channel 4 News yesterday. 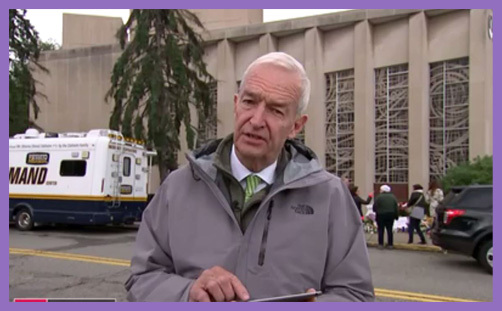 With his customary political impartiality and legendary sense of fairness, Jon Snow stammered his way through the pre-prepared lines on his iPad, and told us that “some Jewish leaders” in Pittsburgh opposed Trump’s visit. Just to make sure we got it, he told us twice. And then he interviewed two Jews – who may well have been leaders and may well have been Republicans: we weren’t told – but they railed not only against Trump’s use of words but against his entire administration, which suggests a rather deeper antipathy. “He is not the person to come here and unite us,” insisted Jonathan Mayo, who was styled not as a rabbi or a community leader, but as a ‘Signatory of letter to Donald Trump’. The letter in question came not from the Tree of Life Synagogue community, but from a Pittsburgh-based Jewish group called ‘Bend the Arc (Jewish action)‘, whose mission is: “uniting progressive Jewish voices across America to fight for justice for all”. The letter was not simply a respectful request for the President to wait a week for the funerals to take place, but it basically told him not to show his face in Pittsburgh until he commit himself to “compassionate democratic policies” (including ceasing his “assault on immigrants and refugees”). Jon Snow didn’t mention that. This group also runs an ‘Interrupt Trump‘ operation: “By replacing his enablers in Congress, we can interrupt Trump’s immoral agenda — including attacks on immigrant families, Muslims, women, people of color, students, and our democracy.” Jon Snow didn’t mention that, either. No, Channel 4 News conveyed to their viewers that Pittsburgh’s Jews (not only their leaders) didn’t want President Trump to come anywhere near Pennsylvania because he has instilled ‘Hate in the White House‘, which is precisely what ‘Bend the Arc (Jewish action)’ wanted him to convey. Jon Snow didn’t tell us that. This is the leader of the Jewish worshipping community which suffered most in this tragedy. In a sense, the views of all the other Jewish leaders – if not of all other Jews – are immaterial. It is his community which mourns and weeps, and he is the focus of their witness to the world at this time. It is difficult to understand why his Jewish neighbours, adhering to other strands of Judaism, are so intolerant of or indifferent to his choice – which may be a political choice or it may be a religious choice – to welcome his President into his Synagogue so they might talk about antisemitism and the Mishnah. Where is the compassion? Where is the respectful humility? Where is the community relationship? Where is the honesty of reporting that Rabbi Jeffrey Myers’ pastoral response to this massacre is to reach out his hand to his President; to welcome, embrace and reconcile? You can attribute the cause of the world’s hate and division to Donald J Trump, if you wish. 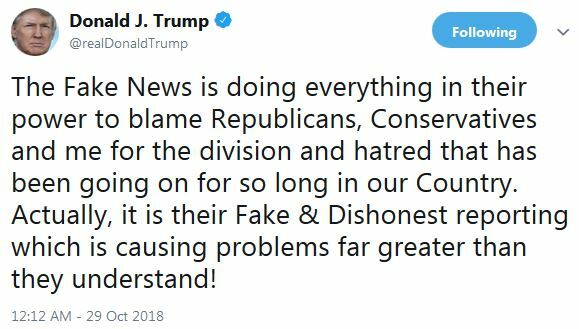 But when so much of the media reporting around him is fundamentally dishonest, inaccurate, fraudulent and pathologically hostile – including that broadcast by (“F**k-the-Tories“) Jon Snow and Channel 4 News – it is no wonder that the President tweets incessantly about the ‘Fake News Media’ being the ‘Enemy of the People’. It is certainly an enemy of truth and a hindrance to enlightenment. Here was an opportunity for Channel 4 News to highlight a moment of intermission and grace in the pervasive hate and division; to report a story of rabbinical outreach and reconciliation unfolding in a nation of bullets and barriers. And all we got were a couple of progressive Democrat Jews whose loathing for Trump is matched only by Jon Snow’s garrulous interjection of his personal opinion and political bias into every ethical deliberation and news report he makes. 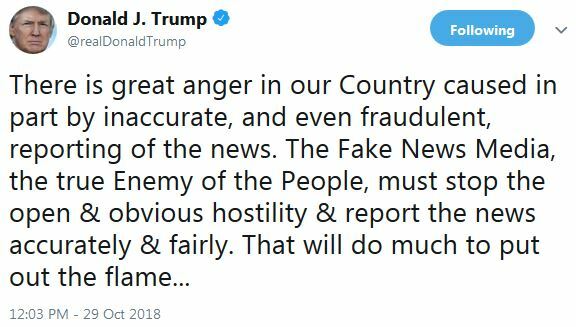 What is wrong with the President’s demand for the news to be reported “accurately and fairly”? You can’t fairly rail against a man’s use of divisive language when your own notions of ‘ought’ and ‘good’ are devoid of moral force and incline toward concealing truth. Perhaps the Editor of Channel 4 News Ben de Pear might explain how the purposeful (please don’t pretend it was inadvertent) omission of Rabbi Jeffrey Myers’ pleasing and refreshing friendliness toward his President – his personal expression of unity in hope and faith – was either accurate or fair?